With summer now seeming like a distant memory, fall is rolling in faster than a candy apple tumbling down a steep hill. But as the trees transition to their autumnal hues of gold, orange, and scarlet, it’s almost time to slip on a layer of fleece and embrace the season at one of the region’s most popular October attractions. 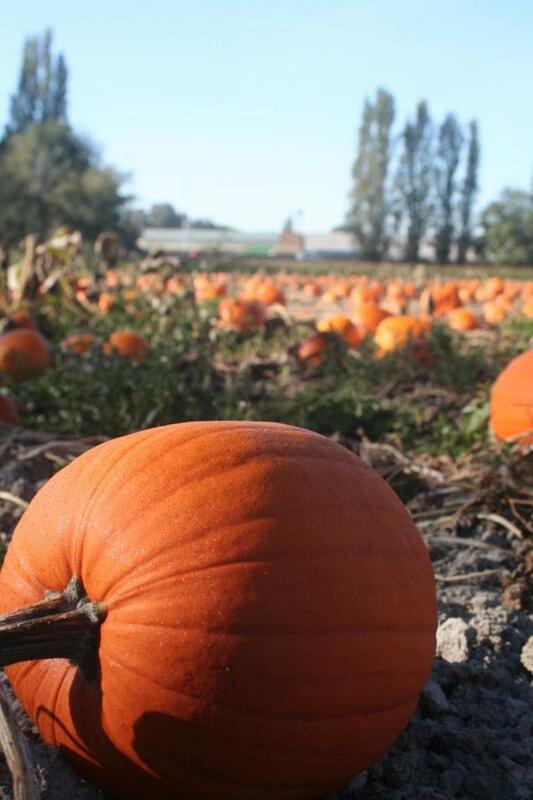 A local legend that’s been running since the early 1980s, the Pumpkin Patch at Richmond Country Farms lures fall fans from across Metro Vancouver and beyond. But if you haven’t been before—or you’re wondering what’s on at the farm this year—here’s the lowdown on why you should gather the family together and head on over. Richmond Country Farms is in East Richmond and it’s easily reached by car (there is plenty of free parking) as well as public transit. Several transit buses stop nearby—see TransLink’s website for handy route-planning info. The farm’s Pumpkin Patch operates from October 6 to October 31, from 9:00am - 1:30pm Monday to Friday, and from 10:00am - 4:30pm weekends and holidays. Weekday hours may be extended on fine-weather days. Call ahead at 604-274-0522 to check the hours on the day you plan to come. 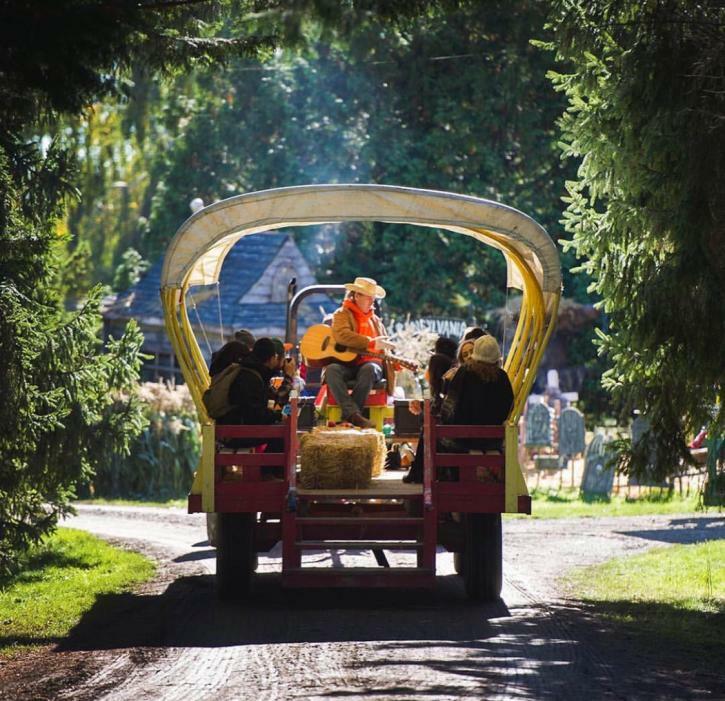 Perfect for families—especially those with children aged 10 and under—visitors will find live music, tractor-drawn wagon rides, and costumed characters Polly Pumpkin and Strawberry Shortcake. The site will be accented with autumnal decorations, while an impressive array of resident farm animals will also be on-hand for viewing. All ticket holders receive one free pumpkin and a tasty Spartan apple! 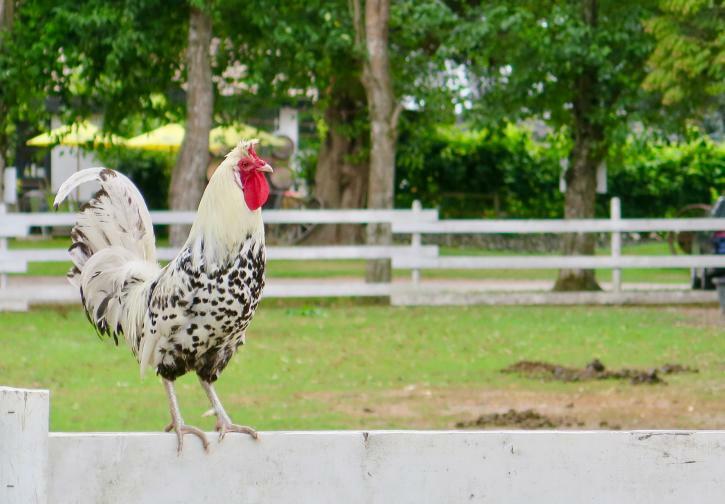 Housed in their own enclosures, the resident critters at Richmond Country Farms include goats, alpacas, donkeys, and some towering Clydesdale horses. Chickens and ducks also call the site home and you’ll likely see some of them wandering around the grounds on your visit. Keep in kind this is not a petting zoo: photos are fully encouraged but you won’t be hugging any goats while you’re here! Isn’t there also a train? Yes! 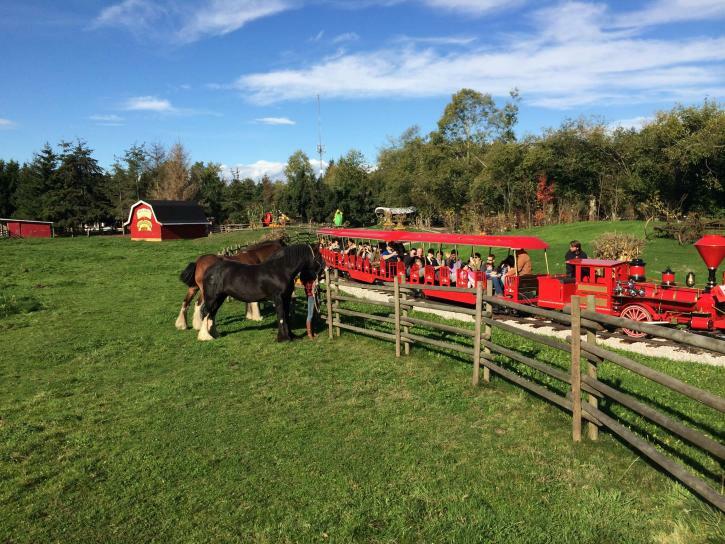 Operating on weekends when the weather is fine, the bright-red CP Huntingdon Miniature Train—a handsome replica of an 1860s steam locomotive—trundles visitors through the pumpkin patch and farm fields. Call ahead on the day you want to come to make sure it’s operating. There is a small additional charge to hop aboard. Is there anything new at the Pumpkin Patch this year? This nostalgic, family-friendly attraction hasn’t changed much over the years—which is why generations of families keep coming back. But the live music stage has been expanded for 2018 so the musicians will have more room to play. Sitting and watching the band is one of the highlights for many Pumpkin Patch visitors. Will I be able to buy pumpkins? Yes! Every ticket holder receives a free pumpkin. But if you’re looking for something more for Halloween or your own pie-making shenanigans, you can also buy some choice farm-grown pumpkins at the onsite produce market. Is there any other produce for sale? Family-run Richmond Country Farms houses one of the area’s largest and most popular destination produce markets. After your Pumpkin Patch adventure, explore the indoor and outdoor stands piled high with seasonal produce from this and other local farms. At this time of year, look out for corn, kale, potatoes, broccoli, and much more. In October, the market runs daily from 9:00am - 7:00pm. Is there anything else to buy? The site also houses its own charming winery. 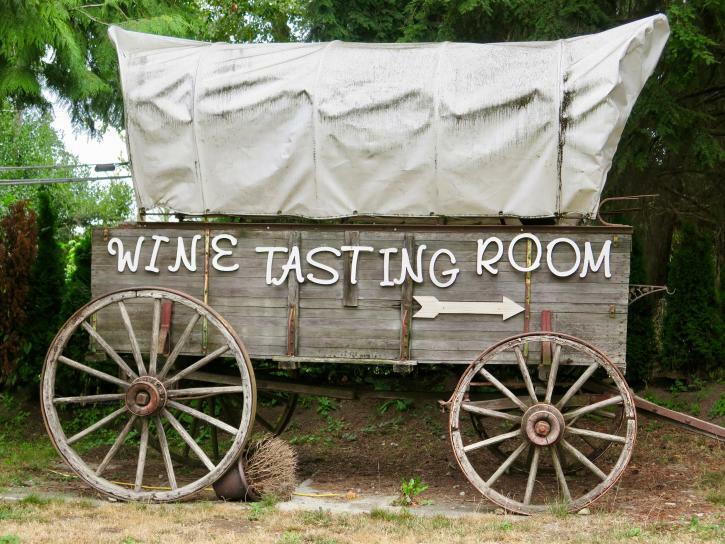 Country Vines Winery has a friendly, rustic tasting room that stocks dozens of well-priced wines made from the farm’s own grapes. Open 11:00am – 6:00pm Wednesday to Sunday at this time of year, it’s a great place to pick-up a few bottles. There are many new releases to sample right now, including the delicious 2017 Estate Pinot Gris. On weekends, there will be a full menu of up to six food trucks at the Pumpkin Patch, serving everything from mini doughnuts to wood-fired pizza. Weekdays food offerings are more limited, however. This is working farm and it’s also October. Boots are highly recommended for muddy fall conditions, and raingear and warm layers are also suggested. Keep yourself warm and dry and you’ll enjoy your visit much more! Are there any farm rules I should know about? Yes. Dogs are not allowed on the farm and smoking is also not permitted. Outside food is not allowed on weekends. 2018 ticket prices are $11 - $13 per person, with weekday tickets and per-person group rates priced slightly lower than weekend rates. Children aged two and under are admitted free, although there is a small charge for their pumpkin. Call ahead to check this year’s Pumpkin Patch admission prices at 604-274-0522 or visit the Richmond Country Farms website for updates.